Ah, the breathless wonder of a gorgeous full moon! Relishing the rare full moon of this Christmas season. The last time there was a full moon on Christmas was in 1977, and the next one is slated for 2034. Carpe diem! This moon image above was taken on Christmas Eve, and I decided to do something different and film the rising of the moon Christmas night. And so I did. Staying close to home I went up the street and set up on a corner that gave me the best view possible from that location. This corner is on a road that joins two main streets (that are 4 miles apart), so it gets quite a bit of use. So the flashes of light in the film are headlights of passing vehicles. Watching a moon rise from the warmth of the inside is quite a bit different from standing outside in the freezing cold…on a corner… in the dark. The 20 or so minutes it took for the moon to ascend seemed stretched beyond an hour. 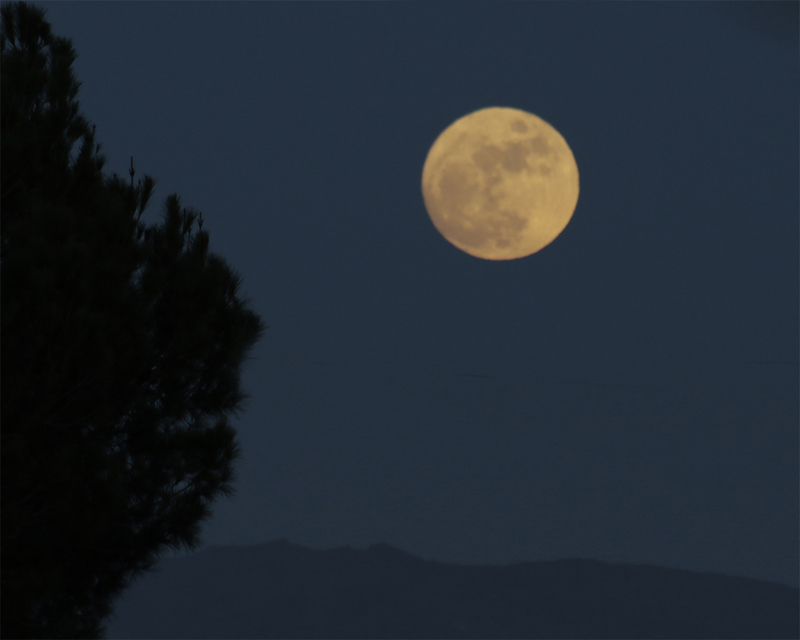 But I stuck it out, got my footage, and compressed the time so you can enjoy the moon rise in a mere 14 seconds.